TORONTO — Shares of BlackBerry maker Research In Motion plunged nearly 30 percent Friday after the company posted a loss and warned of future losses despite releasing its make-or-break new smartphones this year. Analysts were looking for insight into how phones running RIM’s new Blackberry 10 operating system are selling. It wasn’t good. RIM said it sold 6.8 million phones overall versus 7.8 million last year. That includes older models. In wasn’t until well into a conference call with analysts that RIM announced that 2.7 million of the devices sold in the quarter were Blackberry 10 models. RIM’s Blackberry 10 operating system is critical to the company’s comeback. New phones running the BlackBerry 10 software began selling around the world this year. The BlackBerry Z10, a touchscreen model and the Q10, which sports a keyboard, have received positive reviews, but there was a delay in getting them to market in the U.S. The first quarter, however, included a substantial period of sales of the Z10 phone in the U.S. It didn’t include sales numbers for the Q10 in the U.S. The Q10 just went on sale in the U.S. earlier this month. Sales results and RIM’s projections, however, signal that the new BlackBerry 10 phones are not selling well. The company said it anticipates it will generate an operating loss in the second quarter, too. Mike Walkley, an analyst with Canaccord Genuity, said it’s clear the new operating system has not turned the company around. “With Z10, Q10, and Q5 all shipping in the August quarter and BlackBerry still guiding to a loss we believe that is strong evidence BB10 has not turned around BlackBerry in an extremely competitive smartphone market,” Walkley said. Shares of Research in Motion Ltd. dropped $3.93, or 27 percent, to $10.30 in morning trading Friday. The BlackBerry, introduced in 1999, was once the dominant smartphone for on-the-go business people. But it lost its cachet not long after Apple released the first iPhone in 2007. Apple’s device reset expectations for what a smartphone can do. RIM promised to catch up while developing new a software system called BlackBerry 10, which uses technology it got through its 2010 purchase of QNX Software Systems. But the company took more than two years to unveil new phones that were redesigned for the multimedia, Internet browsing and apps experience that customers now demand. During that time, RIM cut more than 5,000 jobs and saw shareholder wealth of more than $70 billion vanish. The Canadian company said it lost $84 million, or 16 cents a share, in the three months ended June 1 on revenue of $3.1 billion. It lost $518 million, or 99 cents per share, on revenue of $2.8 billion a year ago. Analysts expected RIM to earn 5 cents a share on revenue of $3.37 billion. The number of BlackBerry users in the world also fell by four million to 72 million. RIM also said it anticipates it will generate an operating loss in the second quarter. Heins noted the highly competitive smartphone market makes it difficult to estimate revenue and levels of profitability. 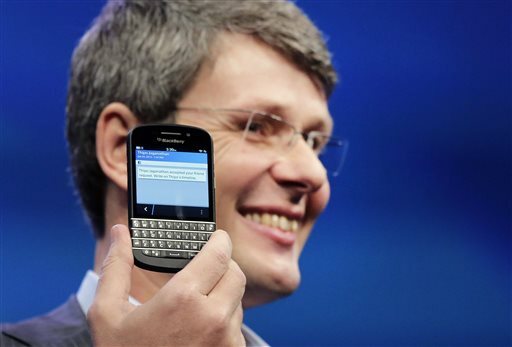 Heins also announced on the call that he has halted further development of RIM’s failed tablet offering, the Playbook. The Playbook has not sold well. “Our teams have spent a great deal of time and energy looking at solutions that could move the BlackBerry 10 experience to Playbook, but unfortunately I am not satisfied with the level of performance and user experience and I made the difficult decision to stop these efforts and focus on our core hardware portfolio,” Heins said. Heins said they’ll continue to support the PlayBook on the existing software platforms and configurations. Asked if RIM will continue to make the Playbook, a RIM spokeswoman said the company is evaluating its hardware strategy. Colin Gillis, an analyst at BGC Partners, said said it’s tough for RIM because it’s hard to make money on handsets now. “There are a lot of people that haven’t been able to make it happen. For all the talk about Apple and Samsung, there are companies like Nokia and HTC,” Gillis said. Gillis said things look bleaker for the company and it’s going to continue to be a struggle. Jefferies & Co. analyst Peter Misek said the high end global smartphone market is saturated and brutally competitive. RIM has unveiled a lower-cost BlackBerry aimed at consumers in emerging markets, but hasn’t said if the device will be available in North America. Misek was expecting the company to sell 4 million BlackBerry 10 phones. He said the sale of 2.7 million new BlackBerry 10 phones was the most disappointing news Friday.